Done for now. It’s not perfect and there are some definately situations where it won’t perfectly reflect reality (and I’ll be strangely disappointed if the creatures don’t exploit these ruthlessly), but it’s a far smoother and more elegant solution than the old “Droop if rotation < 45" system. It may just be the placebo effect, but navigating through a randomly generated map, the properly drooped creatures feel a lot more 'organic' and varied than what I remember of their counterparts from 0.6.1. Still need to do one more of these for compressive forces, which will take into account cross-sectional area and thus prevent sticklegs, but we’re just about done here. These energy losses should prompt natural selection to avoid unbalanced, droopy creatures. I’ve also measured the size of creatures from their skeleton in the default units, and we now have an official length for Primum Specium: 32cm for a child, with an adult being 64cm. I had intended to add a modifier to that, to bring Primum Specium up to a round metre long, but now I’m honestly not sure if I should. I’ve always been a bit iffy on the scale, and 64cm for an adult (the rovers are about the same length, too) isn’t anywhere near as bad as I was expecting. At this scale, the high trees are around 3.8 metres, and a standard size-1 world is a square 153 metres wide, or 5.8 acres. What do you folks reckon? Leave it at 64cm, or apply a modifier and bring it up to 1 meter? Added a button for building fences, a panel for making climate control devices, and a rough placeholder model for them. Nothing says “environmentally friendly” quite like a giant chemical emitter hooked up to a rusty waste barrel. I ended up going for a ‘chemical emitter’ design: since that’s the most plausible way to manipulate temperature in this manner. Think of it like the urban heat-island effect, only a lot more concentrated. 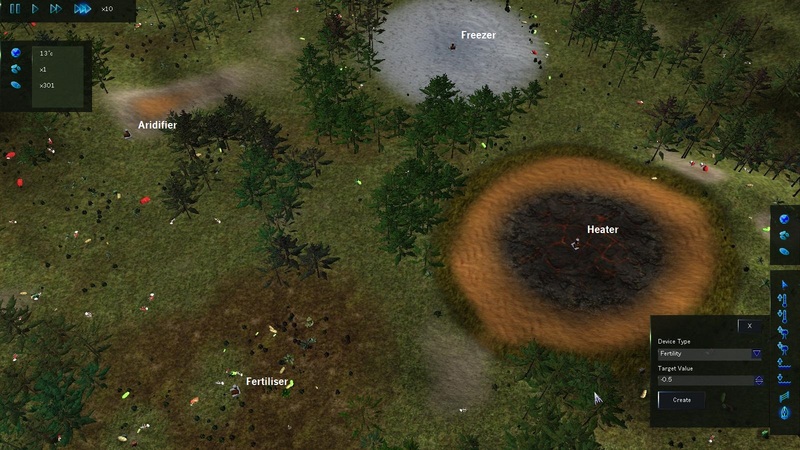 The aridifier and fertiliser aren’t actually any less powerful than the temperature modifiers, but the trees have a tendency to fight against them so their effect is significantly reduced. I’m not really sold on the model design, but it serves it’s purpose for now. We’re finally past the hard stuff: with the internal body physics working, we can focus on finalising the last few features for an 0.7.0 release. Once those are done, I’ll start the bugfixing phase and anounce a release date! So what are those final features? – Fences need to be selectable and removable. Creatures also need to ignore things when they’re behind a fence. 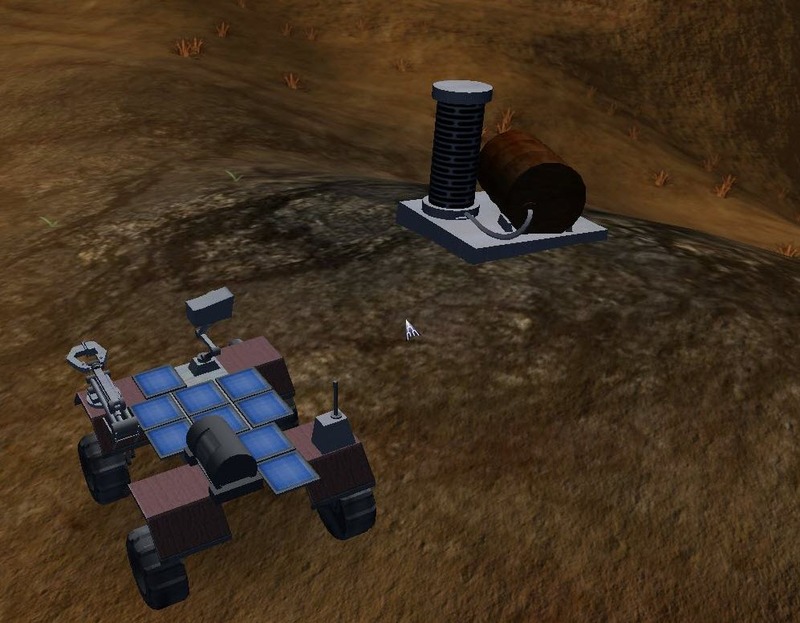 And I’m thinking rovers should probably do the same: as cool as it would be, having rovers navigate around fences rather than just accepting them as a barrier would make it impossible to perform localised artificial selection. – Climate devices need to be selectable and removable, and you need to be able to program their target temperature/fertility. The UI panel includes both of these, so I just need to make it assign them to the new device. 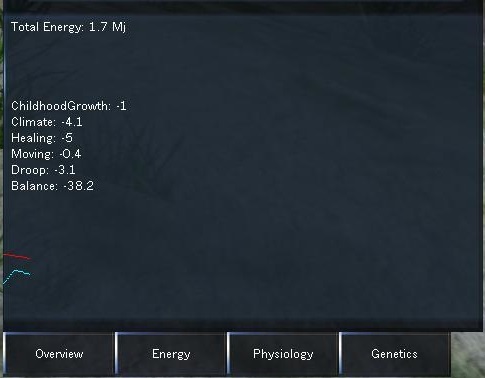 – The Creature Details UI needs adjustment, to report values in our new metric units. – Graze, Feed and Attack Animations need implementing. As previously stressed, these won’t be complex: just basic movements to communicate what the creature’s up to. This entry was posted on August 7, 2014, 12:35 pm and is filed under Uncategorized. You can follow any responses to this entry through RSS 2.0. You can leave a response, or trackback from your own site. Nice Job, Excited to play it when it is released. Can this be implemented in the game somehow? Nice, waiting eagerly for the release, I just made a donation. I just hope mouse capture and controls are improved, because in my case it ruins the experience.